AUSTIN, Texas (Bennington Vale Evening Transcript) -- In a letter to U.S. Health and Human Services Secretary Kathleen Sebelius released Monday, Texas Gov. Rick Perry formally rejected two key provisions in President Obama's healthcare overhaul measure. The proposals in question, struck down by a recent Supreme Court ruling, involved the expansion of Medicaid coverage and the establishment of online healthcare exchanges. As part of the court's decision, the federal government cannot withhold a state's Medicaid allocation if it fails to expand the program for the poor. And if a state chooses not to create an online healthcare exchange, the federal government can develop one for it. 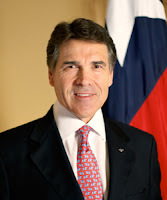 Perry joins a chorus of outraged Republican governors who refuse to support these measures. "I will not be party to socializing healthcare and bankrupting my state," Perry asserted. In the first two years alone, based on state figures, nearly two million people would be added to Texas’ Medicaid rolls. By Perry's calculations, that expansion could cost $27 billion over 10 years. "When you consider how much money taxpayers are already dumping into benefits packages for state officials and government workers, Texas simply can't afford to include two million more people." State employees, such as governors, belong to the Texas Employees Retirement System (ERS), which provides generous pension benefits that have largely been eliminated in the private sector. "The government's in financial despair," Perry said. "As the Republican Party has explained all along, governments need to operate more like commercial enterprises if they're going to succeed. And that means getting rid of freeloaders, budgetary fat, and socialized benefits." The numbers would support Perry's claims. In Texas, private employees receive higher compensation than their public sector counterparts, but the median benefits package for government workers was found to be $2,000 to $5,000 higher. "There's no reason taxpayers should be paying to provide better health care for government officials than they get themselves," Perry complained. "It's ridiculous. Private companies, on the other hand, have taken a competitive and strategic approach to cutting benefits costs. They can weather economic storms 'cause they got that money back in the kitty. It also lets them create job security and growth. But the government is flying by the seat of its pants most times, and it can turn around and steal that money through taxes if hard times crop up. It ain't fair." Under the ERS, a state official with Perry's tenure could have retired 11 years ago with lifetime health care paid for by the state. And every year that individual remains in office adds to the burden of taxpayers, which Perry is tirelessly fighting to alleviate. If a state executive similar to Perry were to retire at the end of his current term in 2014, he could collect $119,025 a year, based on the length of his service and optional provisions. He'd also receive Social Security, bringing his annual compensation to over $140,000. "The state pays 100-percent of the cost of state employees' health insurance premiums," Perry stated, a perceptible note of frustration and disgust in his voice. "And by the state, I mean the taxpayers. Consider this, a retired Texas governor will receive state-financed health care for the rest of his life, along with Medicare, and that's coming out of the incomes of hard working voters in every household across Texas -- the governor's not paying one red cent for it. It's wrong. It's socialism, and we can't stand for that. We need to cut taxes and let the people keep the money they've earned. But President Obama wants me to expand these benefits to millions of other folks who aren't paying for health insurance. That's just lunacy. I wouldn't stand for it, and I don't expect my constituents to either."